This building and Carlyle Condos immediately to the west are twins that were built in the late 1970s from almost-identical plans. Ashbury was completed first as a rental building in 1978 and condo converted first, in 1990. 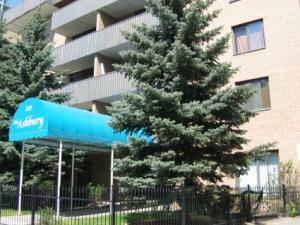 Carlyle was completed second, in 1979, and was also condo converted later, in 1994, with sales continuing through 1999. Although outwardly peas-in-a-pod, they had different builders and there are some differences between the buildings on the ground floor. As well, Ashbury sits on a broader lot, but after that these are the same building, made of pre-fabricated concrete sections assembled on site to reach six storeys, each housing 32 small one and two-bedroom suites served by a single elevator.Both buildings inherited problems with the manufacture of the concrete slabs, allowing balconies to deteriorate and requiring expensive repairs. I've admired their owners and boards for biting the bullet and self-taxing for the funds to make the needed repairs. With that work done, though, these are concrete buildings with decorative brick cladding and painted-metal railings that all should stand the further tests of time. Each building has a mix of indoor assigned common-property parking and assigned surface stalls partly tucked under the back of each building. There are coin-op laundries on some floors at the Carlyle and on every floor at Ashbury. There are storage lockers in the basement of both buildings, but I'm not sure if there are enough that every suite gets one.Floor plans at Ashbury are mostly two-bedroom homes of just under 800 square feet and up to 958 square feet on the top floor, which is larger because it partly overhangs the rest of the building. Renovations at condo conversion were modest in both buildings, so don't look for granite counter tops or hardwood flooring. These are affordable homes compared to new condo towers such as Chocolate next door.Exterior windows and doors a Ashbury are common property for maintenance and future replacement.